Sleeps 4. 2 Bedrooms. 1 Bathroom. Chrysoula is a modern two bedroom apartment situated in the heart of the pretty seaside village of Loggos and providing comfortable accommodation for couples or smaller families who want to be in the village and feel part of village life. 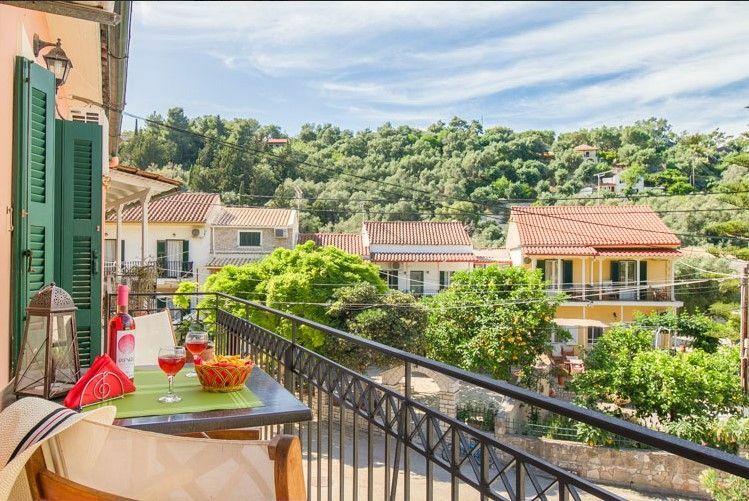 The apartment is very well located for the range of tavernas, cafes and shops around the village, while the village beach and picturesque harbour are a two-minute walk away. The lovely beaches of Levrechio (five minutes) and Marmari (ten minutes) are within easy walking distance. Chrysoula consists of two bedrooms (one double and one twin) a shower room and an open-plan dining/living room with kitchen. From the living room French windows open out onto a large veranda with table and chairs and a view of village houses and trees. Access to the apartment, which is on the first floor, is up a flight of steps to the side of the Mastoras grocery store. As the island bus passes through Loggos two or three times a day en route to Lakka and Gaios, the other main villages on Paxos, there is no need to hire a car. Great location. Basic but clean and comfortable. The apartment was really conveniently located in the village. Close to everything and a beautiful beach with shade (essential for us). Air con only in the bedrooms so quite hot in the common space especially in the evening (tho they provided a fan on request). No mozzie screens so take repellent. The owner lives nearby and was very responsive to any request and helpful. It worked very well for us and we would go there again.